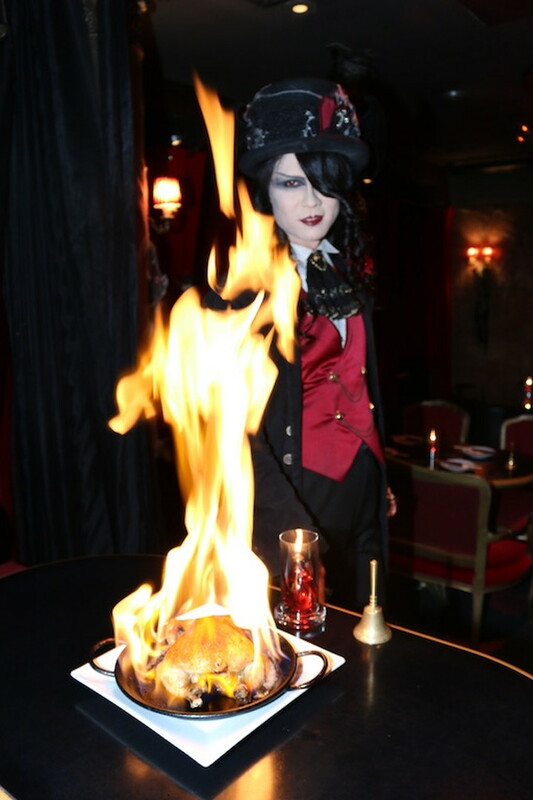 TOKYO NIGHT SPOT - It is a well-established restaurant in Ginza under a concept of a place where vampires gather every night. 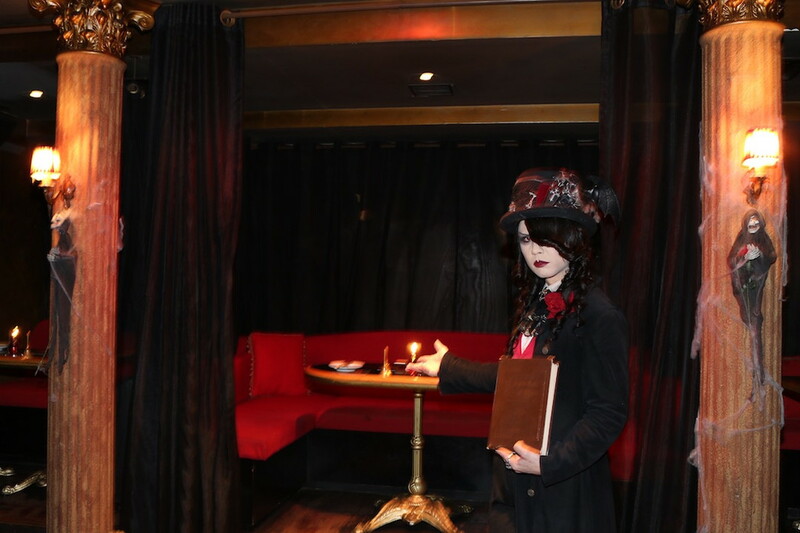 Ginza Restaurant Vampire Café (Vampire Café) is just the place for vampires and those who are looking for a restaurant to enjoy meals with a unique atmosphere. 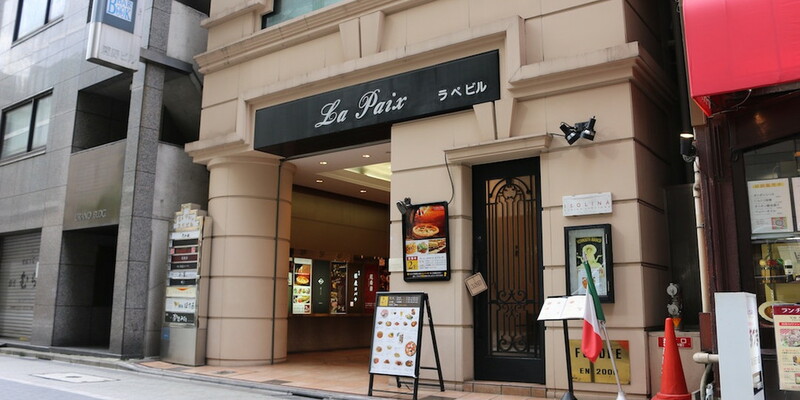 It has been 18 years since this restaurant with a motif of Dracula House was established in Ginza, Tokyo. Visitors are inevitably surprised at its high-quality meals. Dracula House revived in the center of Tokyo. 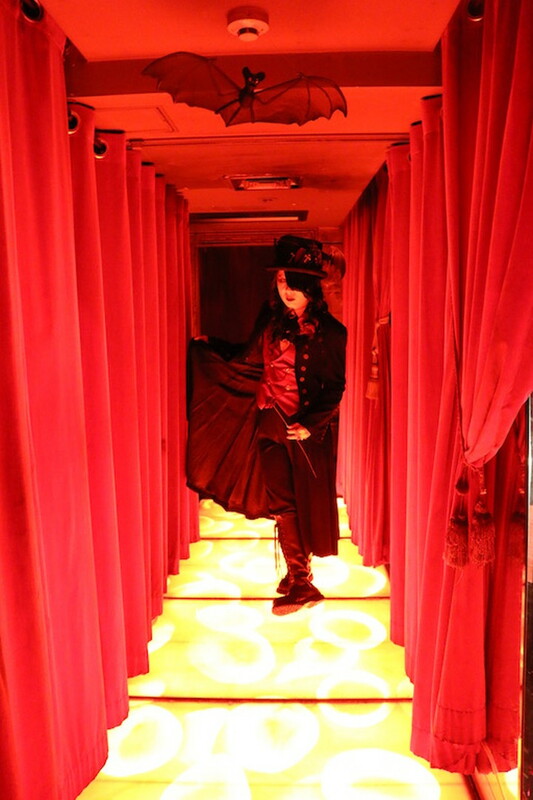 Dracula House revived in Ginza, the center of Tokyo. Rumor has it that vampires who hide themselves in the city gather every night at the house which Dracula dominates. What is waiting for us? We took the courage to join vampires. 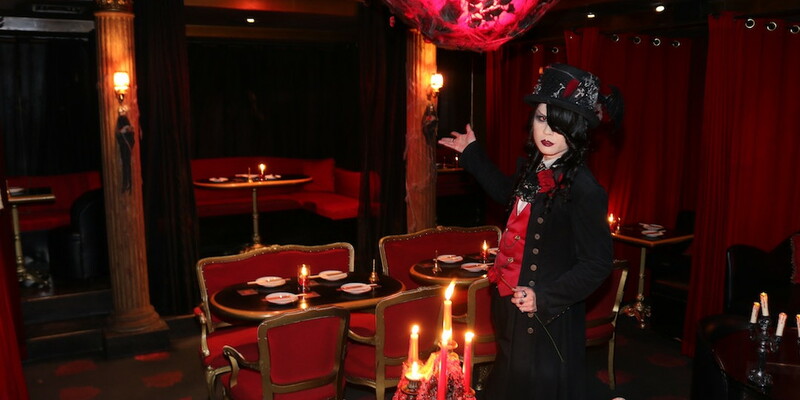 It was Vampire Café established with a motif of a vampire’s house that we visited to report. When we entered the entrance, we heard a spooky BGM. And the count received us! The count took us to the main floor. We got excited as vampires while going through the red corridor designed with the image of blood crystal. We see bats flying above the room. 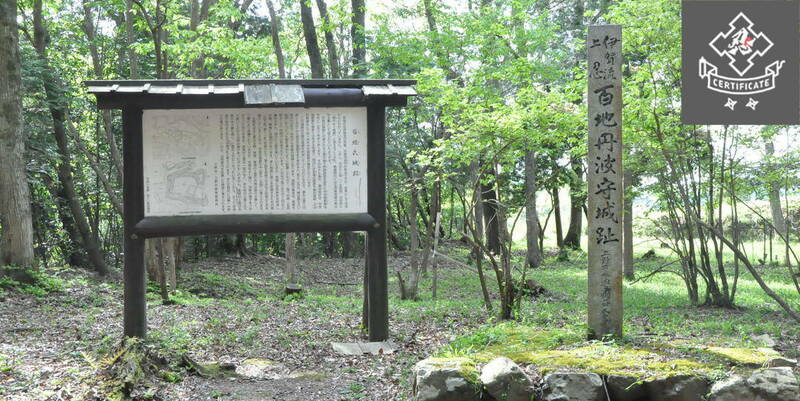 Vampires’ party is held here. It is equipped with red chandeliers which bats are flying above, and semi-private rooms are divided by red velvet curtains on the guest room floor. 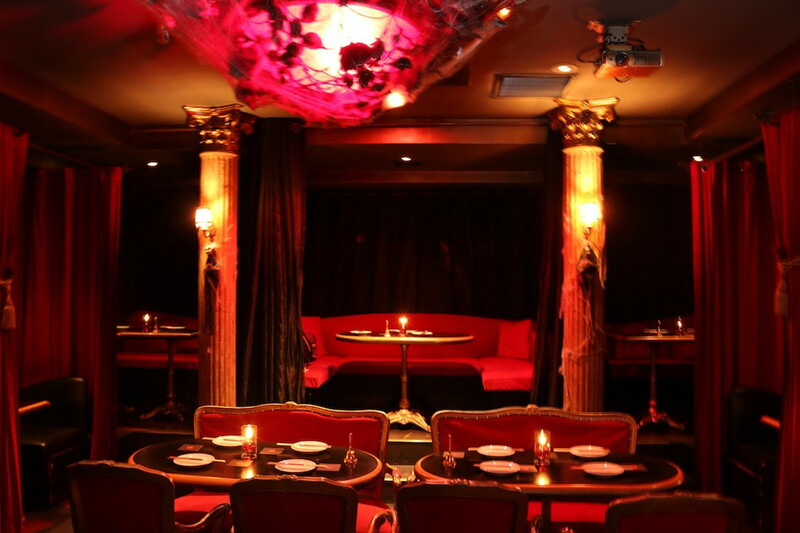 Everything makes visitors feel the atmosphere suitable for vampires’ party. I recommend the seat called “Georgios’ Alter”. We were directed to the seats called “Georgios’ Alter” situated in the back of two pillars. 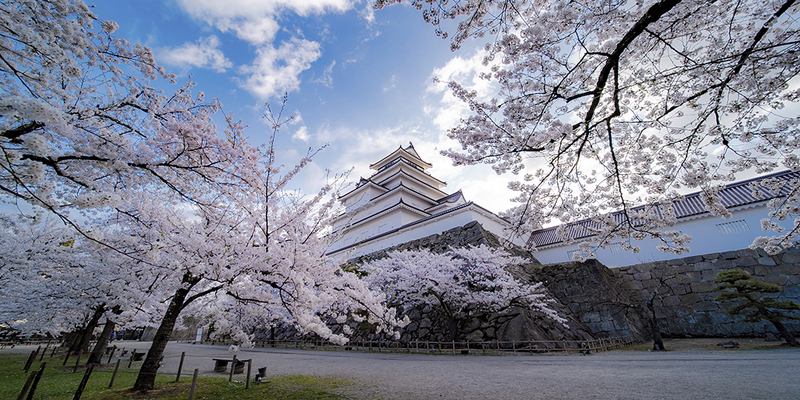 4 to 6 people are able to spend relaxing time in the space. 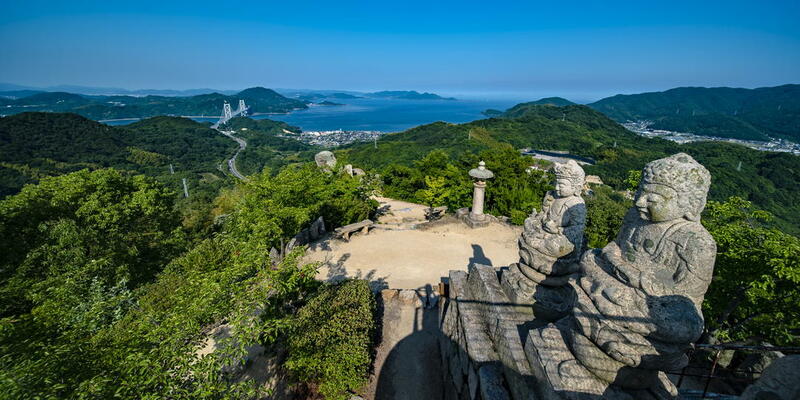 This area is situated in a higher position on the floor so that people are able to overlook the whole floor. It is also equipped with a coffin where a vampire lies. 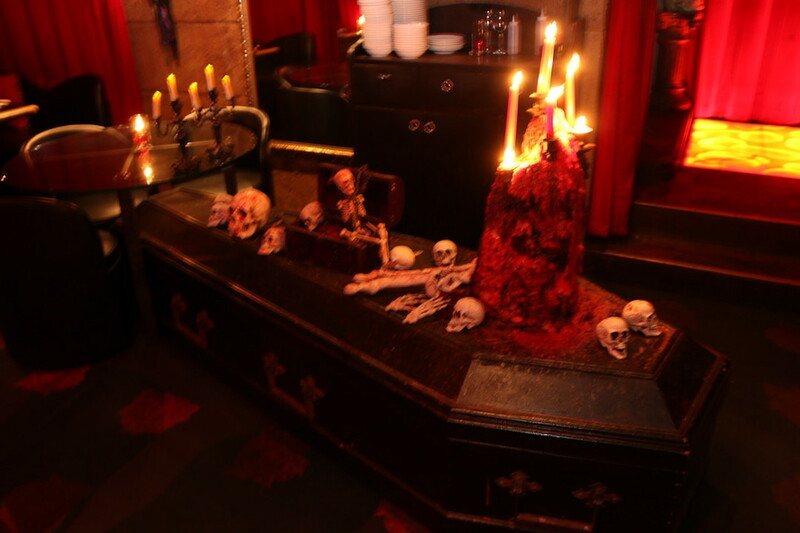 It is also equipped with an art object of a coffin for a vampire on the floor. It is an imported authentic coffin. There are also some vampire maids, not just the counts. It is an original cocktail made based on a concept of the vampire. Please don’t forget it is a restaurant. They served us drinks which we ordered first. 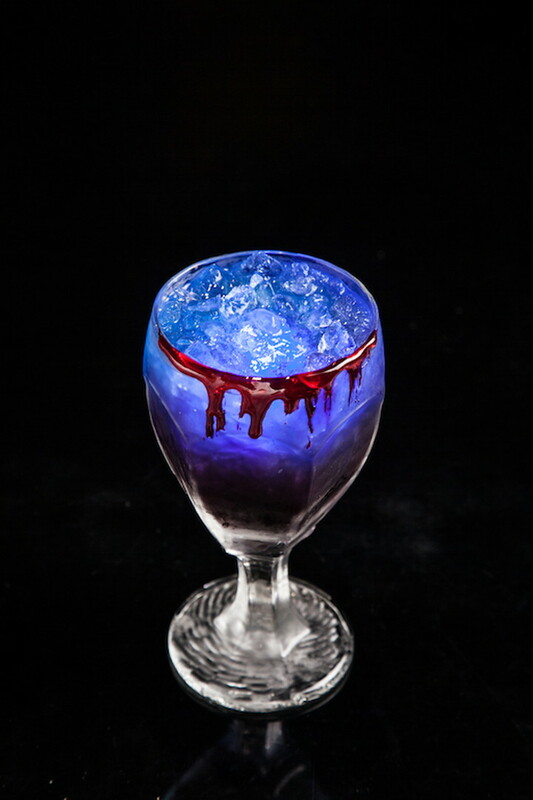 This original cocktail named “Dracula” is made with grape juice and blue curacao mixed with tonic water. Counts love to sip it. 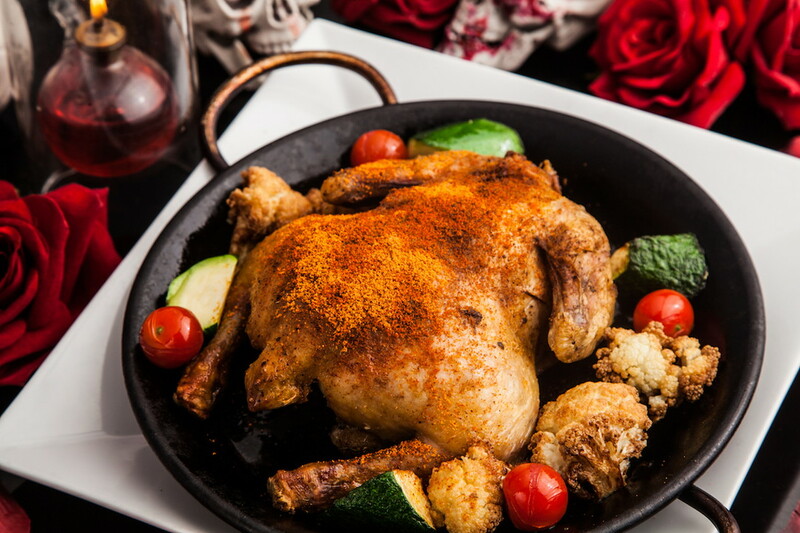 Following drinks, the count brought us evil hot chicken named “Tragic execution by burning at a stake to judge the trailer.” This is a spicy whole roasted chicken, but it is not just tasty! The fire flares up on the dish. When the staff sprinkles alcohol and sets fire on the top, a pillar of fire shoots up. You may feel scared when looking at it close to you, but this performance makes the chicken more savory. A poisonous spider appears as a desert. At last, the desert is served. 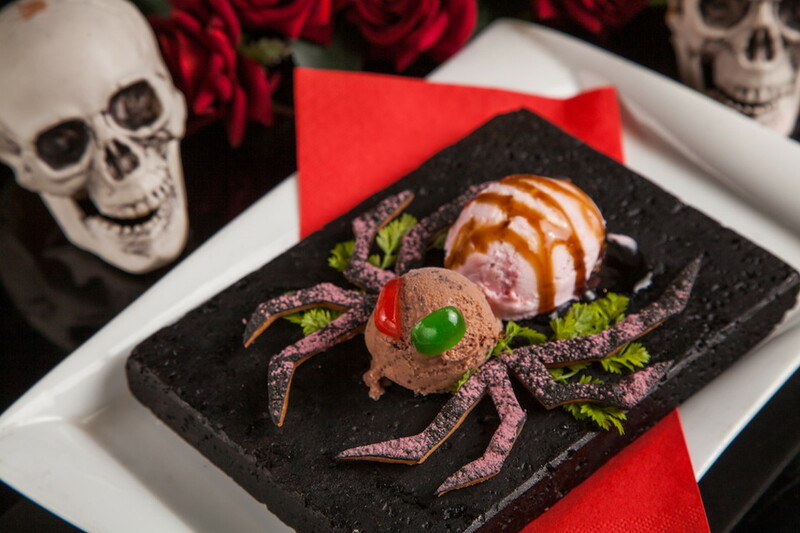 Assorted ice cream, “Poisonous spider in the dark fed by the Count” is shaped with a poisonous spider made with two kinds of ice cream, which is so realistic that you may need to be courageous to eat it. Anyway, we ate it up! Now, we have joined vampires! 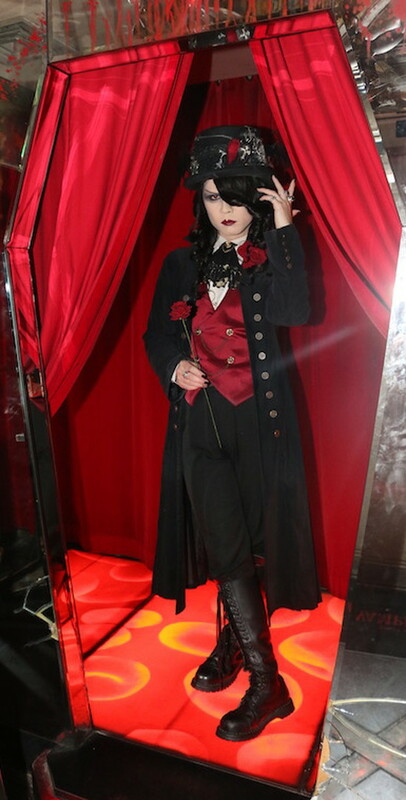 Vampire Café established based on a concept of Vampires’ house is located on the 7th floor of a building in Ginza. 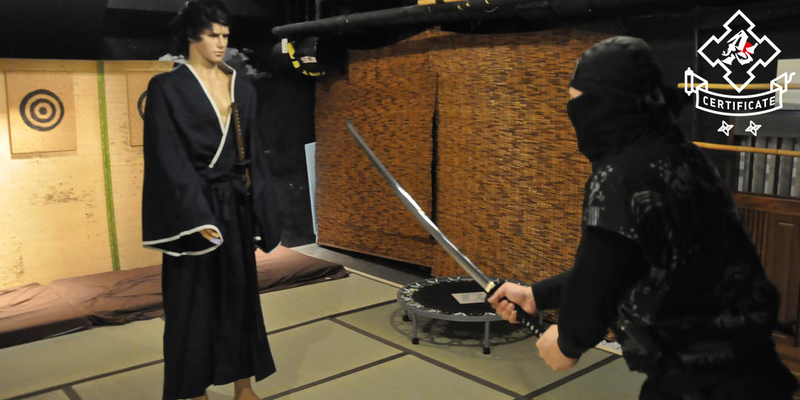 The counts are unexpectedly friendly so that visitors are able to enjoy vampire talk with him. 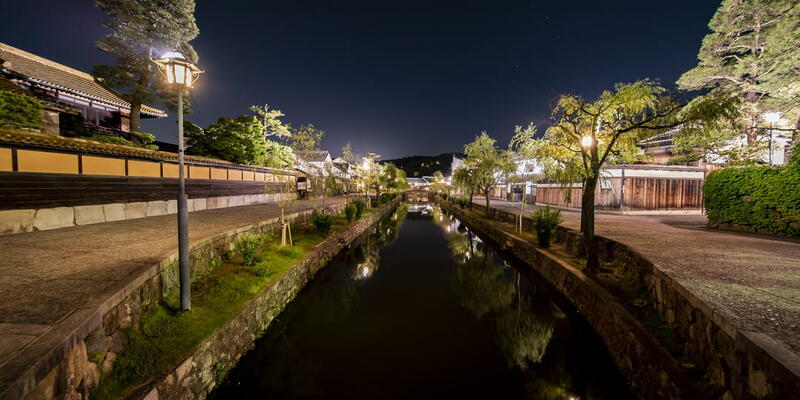 Why don’t you escape the hustle and bustle of a city and enjoy spooky and tasty meals?